There is a large number of possible applications for heat generation. It makes financial sense in particular where waste heat can be used as a heat source, which does not incur any additional ongoing costs. Its particular strengths are played out where high temperatures are required that are to be used directly. The rotation heat pump provides particular benefits if the source and sink are not constant. 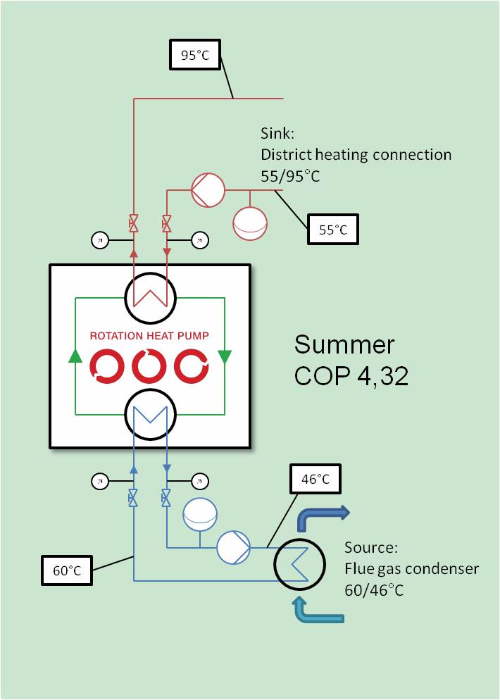 The combination of two rotation heat pumps in order to attain a temperature rise of up to 120 °C is a unique application. The heat can be used for your own needs, or possibly also fed into an existing district heating distribution system. With standardised construction, the rotation heat pump can be adapted to specific requirements and also to new temperature ranges at any time. It can supplement existing systems and processes, be integrated in new production facilities, and also replace existing, conventional systems for process heat generation. Application possibilities are found in the following industries, for example: paper industry (graphical papers, hygiene papers, packaging, technical paper production...), food industry (dairies, sugar production, distilleries, breweries, frozen food production...), chemical industry (organic base materials, fertilisers, petrochemical, other chemical products), textile industry, drying processes (wood, tiles, etc. ), plastics, automotive industry, metal industry. The following exemplary general conditions give an impression of the different application possibilities, whereby all values in between are naturally possible. These are guide values that are achieved in practice. The exact data is dependent on the specific application. The requirements for integration are low, and the installation costs are usually lower than for conventional heat pumps. 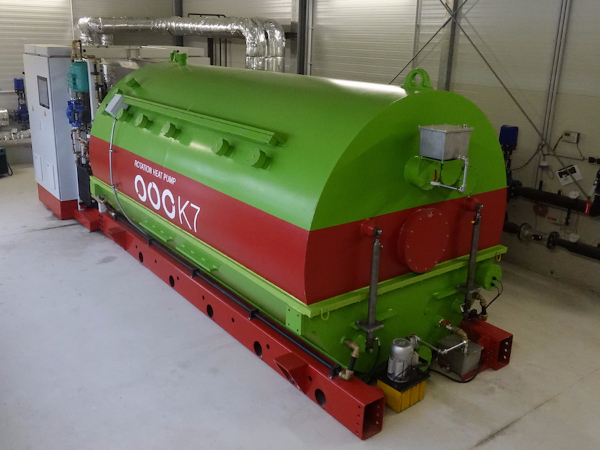 In heat generation, waste heat from combustion processes – for example at a very low temperature level like from a flue gas condenser – can be raised to a directly useable level – for example to raise the district heating return to the district heating supply. Here, the integration is typically quite easy, because there is already a water circuit that can be used either directly or integrated via heat exchangers. For this type of application, a COP that is up to 100% higher compared to conventional heat pumps can be expected. Drying processes are used in many industries (e.g. tile manufacturing, the food industry, paper industry). Here, the ambient air can be used with the help of the rotation heat pump to raise the air temperature for industrial drying and simultaneously cool ambient air for another process step. Naturally, waste heat from other processes can be used just as well. Drying often requires different temperatures throughout the process. The RHP can continuously adjust the temperature electronically controlled. One particularly advantageous application is when hot water is required in the production process (e.g. in the chemical industry). In this case, cooling water can be used as a source, and the hot water can be provided for the production process. This is a very efficient application in a temperature range that cannot be achieved by conventional heat pumps. Instead of generating heat and cold separately, a rotation heat pump can also be used. The high flexibility of the ecop process is seen in the efficiency: In specific applications, temperatures often fluctuate very highly around the design points so that inflexible systems often have to accept low hours under full load, lower performance, poor COPs and hence long, actual amortisation times. Lower cross-sections can be used in the pipework during the installation between the system and source or alternatively sink. Since the pipework is often several hundred metres long, this results in significant savings. Furthermore, accumulators are often not necessary. In operation, the ROTATION HEAT PUMP has considerable advantages over maintenance-intensive systems with reciprocating piston compressors and screw-type compressors. The principle of rotation is considerably easier on material and mainly proven, standard, industrial components can be used. Comparison of the total costs in the first 10 years. The exact numbers and slope of the lines depends on the specific application. The total costs mean all the costs of a project for the setup and integration, i.e. the costs of the system, installation, planning, civil engineer costs, storage, regulation. 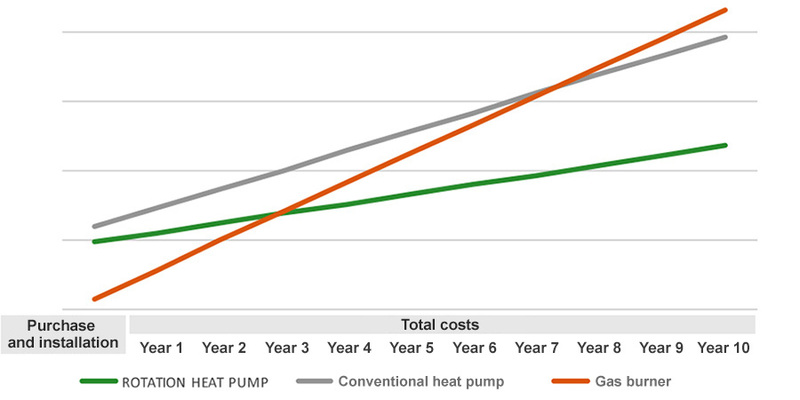 Even with the currently low electricity and gas prices, the payback period of the ROTATION HEAT PUMP is less than 3 years. It is true that simply the system costs are higher than for the comparable systems, but when the lower installation costs are taken into consideration, the total acquisition is less expensive than conventional heat pumps. Naturally a gas burner is considerably cheaper to buy. However, it has significantly higher operating costs and is also not subsidised, so that the total costs are already higher after 3 years than a ROTATION HEAT PUMP. Subsequently, the benefits of the ROTATION HEAT PUMP become greater from year to year. Conventional heat pumps are more expensive right from the start and require considerably longer to amortise compared to a gas burner. They also lose as time progresses compared to the rotation heat pump from ecop due to the lower COP. „Bioenergie Bucklige Welt GmbH“, located in Schwarzau (Austria), put a ROTATION HEAT PUMP K7 into operation in spring 2017. Bioenergie Bucklige Welt operates a biomass cogeneration plant. It produces 16 mio kWH electrical energy and 33.000 MWh of heat per year. It supplies private and public buildings in the region (e.g. the Linsberg spa) with heat. Because of increasing demand an expansion of the capacity was planned. There was unused waste heat that had no constant temperature, so the ROTATION HEAT PUMP came into play. There were about 20 possibilities for integration. Each of them was calculated and the most efficient was chosen. 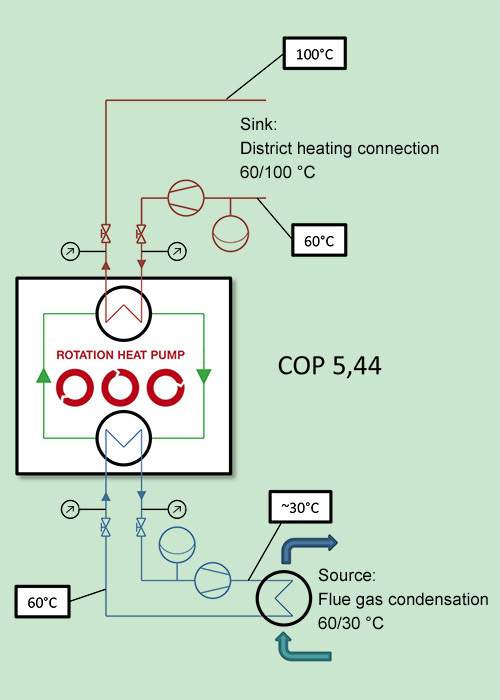 The heat pump uses as source heat from the condenser of the steam turbine und increases the return flow temperature of the district heating system. Thus less energy is required to reach the necessary maximum flow temperature. The steam from the turbine so far was cooled with fans und heat was given off to the environment. The high flexibility of the ROTATION HEAT PUMP is fully used because temperatures differ between summer and winter (source winter: 42° Celsius, source summer: 60°). 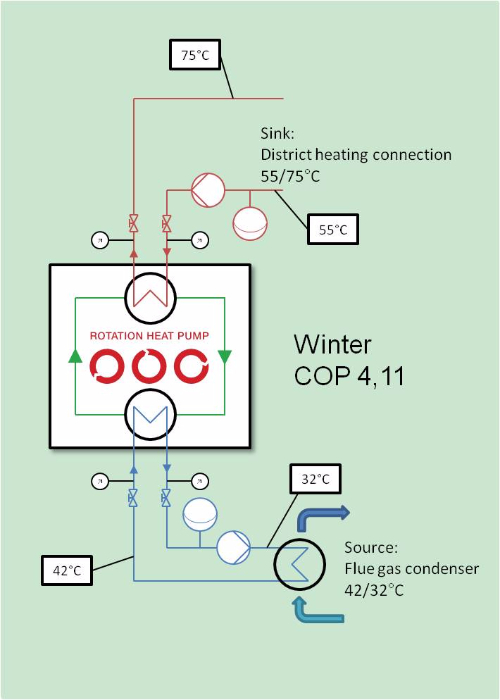 Conventional heat pumps can only be optimized for one operating point, RHP can efficiently deal with different temperatures with only one plant (adoptions are made with rotation speed). One and the same plant can process different temperature conditions in sink and source in summer and winter. 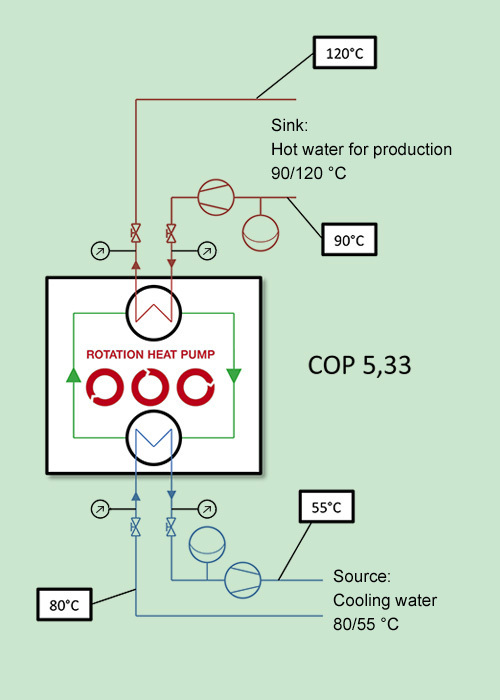 The adoption is controlled through the rotation speed of the heat pump.